The golden jubilee of the Britain’s leading Bengali newsweekly ‘Janomot’ was celebrated in the UK recently amid huge enthusiasm. 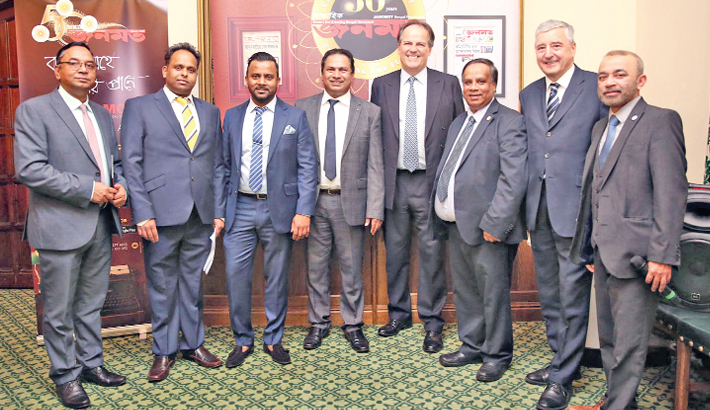 Besides, a year-long celebration of the weekly’s 50th year of publication also kicked off at the Commonwealth Parliamentarian Association room of the House of Commons of the United Kingdom, says a press release. Top newsmakers from politics and business to media and community were present at the event hosted by Labour’s Shadow Minister for Women and Equalities Dawn Butler MP. Janomot Editor Mohammed Nobab Uddin addressed the welcome speech while Editor-in-Chief Syed Nahas Pasha delivered a brief speech. Janomot Managing Director Amirul Islam Choudhury conducted the ceremony while its Director Junaid Choudhury thanked everyone for attending. Among other speakers — Minister of State for Asia and the Pacific at the UK Foreign and Commonwealth Office Mark Field, Bangladesh’s High Commissioner to the UK Saida Muna Tasneem, former British high commissioner to Bangladesh Anwar Choudhury, Labour’s Bethnal Green and Bow MP Rushanara Ali, Poplar and Limehouse MP Jim Fitzpatrick, Conservative MP for Sutton and Cheam Paul Scully, MP for Ealing Southall Virendra Sharma, UK Bangladesh Catalysts of Commerce and Industry President Bajloor Rashid MBE, London Bangla Press Club president Emdadul Haque Chowdhury, Brent Council’s former mayor Councillor Parvez Ahmed and former founder of Janomot and chief editor Anis Ahmed. Founded in London in 1969, it is the oldest running Bengali newspaper in the United Kingdom.